Problem D15: You have a large container that has two partitions inside separated by an insulating wall. All the sides of the container are also thermal insulators. The left side has a volume of V0 and the right side has a volume of 2V0. The left partition contains one mole of a monatomic gas that is initially at an absolute temperature of n1T0. 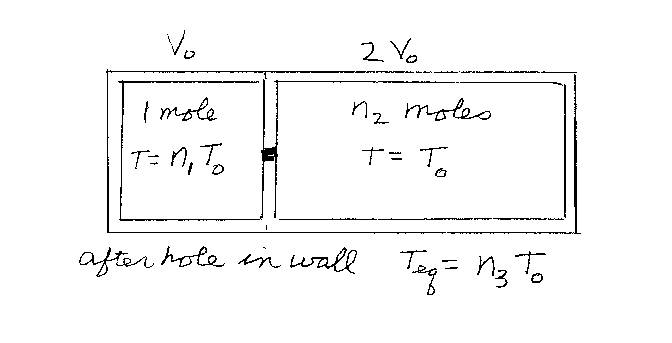 The right partition contains n2 moles of the same gas, but at a temperature of T0. Now someone pokes a hole in the wall between the two partitions, the gases can mix, and the system comes to thermal equilibrium. If the final temperature of the system is Tfinal=n3T0, what is n3? Note that n1, n2, and n3 are unitless.